The gyro in the turn-and-slip indicator rotates in the vertical plane corresponding to the aircraft’s longitudinal axis. A single gimbal limits the planes in which the gyro can tilt, and a spring works to maintain a center position. Because of precession, a yawing force causes the gyro to tilt left or right, as viewed from the pilot seat. The turn-and-slip indicator uses a pointer, called the turn needle, to show the direction and rate of turn. The turn-and-slip indicator is incapable of “tumbling” off its rotational axis because of the restraining springs. When extreme forces are applied to a gyro, the gyro is displaced from its normal plane of rotation, rendering its indications invalid. Certain instruments have specific pitch and bank limits that induce a tumble of the gyro. 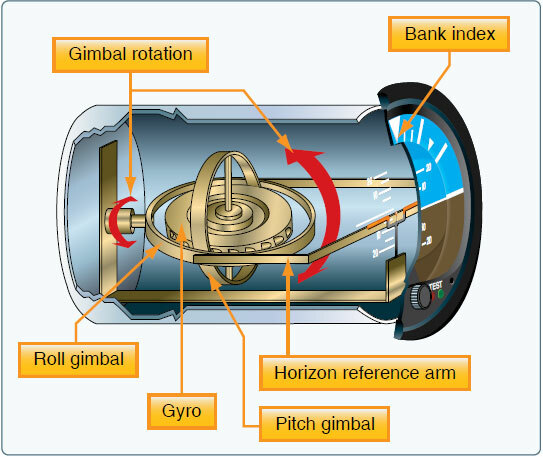 The gimbal in the turn coordinator is canted; therefore, its gyro can sense both rate of roll and rate of turn. Since turn coordinators are more prevalent in training aircraft, this discussion concentrates on that instrument. When rolling into or out of a turn, the miniature aircraft banks in the direction the aircraft is rolled. A rapid roll rate causes the miniature aircraft to bank more steeply than a slow roll rate. 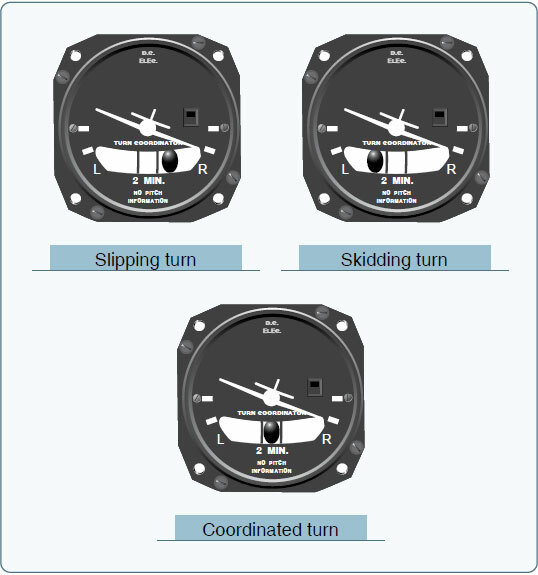 The turn coordinator can be used to establish and maintain a standard-rate turn by aligning the wing of the miniature aircraft with the turn index. Figure 8-22 shows a picture of a turn coordinator. There are two marks on each side (left and right) of the face of the instrument. The first mark is used to reference a wings level zero rate of turn. The second mark on the left and right side of the instrument serve to indicate a standard rate of turn. A standard-rate turn is defined as a turn rate of 3° per second. The turn coordinator indicates only the rate and direction of turn; it does not display a specific angle of bank. Figure 8-22. If inadequate right rudder is applied in a right turn, a slip results. Too much right rudder causes the aircraft to skid through the turn. Centering the ball results in a coordinated turn. The inclinometer is used to depict aircraft yaw, which is the side-to-side movement of the aircraft’s nose. During coordinated, straight-and-level flight, the force of gravity causes the ball to rest in the lowest part of the tube, centered between the reference lines. Coordinated flight is maintained by keeping the ball centered. If the ball is not centered, it can be centered by using the rudder. To center the ball, apply rudder pressure on the side to which the ball is deflected. Use the simple rule, “step on the ball,” to remember which rudder pedal to press. If aileron and rudder are coordinated during a turn, the ball remains centered in the tube. If aerodynamic forces are unbalanced, the ball moves away from the center of the tube. As shown in Figure 8-22, in a slip, the rate of turn is too slow for the angle of bank, and the ball moves to the inside of the turn. In a skid, the rate of turn is too great for the angle of bank, and the ball moves to the outside of the turn. To correct for these conditions, and improve the quality of the turn, remember to “step on the ball.” Varying the angle of bank can also help restore coordinated flight from a slip or skid. To correct for a slip, decrease bank and/or increase the rate of turn. To correct for a skid, increase the bank and/or decrease the rate of turn. One additional tool that can be added to the aircraft is a yaw string. A yaw string is simply a string or piece of yarn attached to the center of the wind screen. When in coordinated flight, the string trails straight back over the top of the wind screen. When the aircraft is either slipping or skidding, the yaw string moves to the right or left depending on the direction of slip or skid. During preflight, ensure that the inclinometer is full of fluid and has no air bubbles. The ball should also be resting at its lowest point. When taxiing, the turn coordinator should indicate a turn in the correct direction while the ball moves opposite the direction of the turn. The attitude indicator, with its miniature aircraft and horizon bar, displays a picture of the attitude of the aircraft. The relationship of the miniature aircraft to the horizon bar is the same as the relationship of the real aircraft to the actual horizon. The instrument gives an instantaneous indication of even the smallest changes in attitude. The gyro spins in the horizontal plane and resists deflection of the rotational path. Since the gyro relies on rigidity in space, the aircraft actually rotates around the spinning gyro. An adjustment knob is provided with which the pilot may move the miniature aircraft up or down to align the miniature aircraft with the horizon bar to suit the pilot’s line of vision. Normally, the miniature aircraft is adjusted so that the wings overlap the horizon bar when the aircraft is in straight-andlevel cruising flight. The pitch and bank limits depend upon the make and model of the instrument. Limits in the banking plane are usually from 100° to 110°, and the pitch limits are usually from 60° to 70°. If either limit is exceeded, the instrument will tumble or spill and will give incorrect indications until realigned. A number of modern attitude indicators do not tumble. Every pilot should be able to interpret the banking scale illustrated in Figure 8-24. 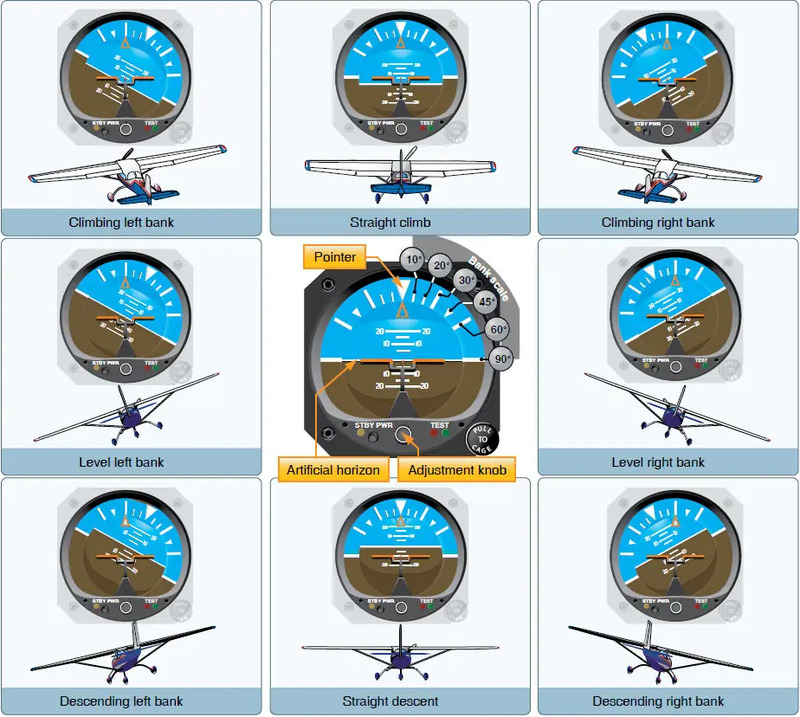 Most banking scale indicators on the top of the instrument move in the same direction from that in which the aircraft is actually banked. Some other models move in the opposite direction from that in which the aircraft is actually banked. This may confuse the pilot if the indicator is used to determine the direction of bank. This scale should be used only to control the degree of desired bank. The relationship of the miniature aircraft to the horizon bar should be used for an indication of the direction of bank. The attitude indicator is reliable and the most realistic flight instrument on the instrument panel. Its indications are very close approximations of the actual attitude of the aircraft.